So Yule is fast approaching, and this Yule will represent my first attempt at incorporating some Celtic elements and traditions into what has so far been a Germanic and Norse festival period for me. Prior to becoming heathen in 2006 I didn't celebrate the winter solstice in any special way, beyond the secular; after becoming heathen I began celebrating the "traditional" 12 days of Yule, beginning on Mother Night and ending usually either on New Year's Eve or New Year's Day. I followed the CR approach of celebrating the four Irish fire festivals as holidays and not acknowledging any Celtic aspects of the solstices or equinoxes. However this year I am looking at what the more modern Celtic traditions of this time of year are and how they may relate to older Heathen ones in order to create a more synchretic personal approach (celebrating with my kindred is still Norse oriented). In Germanic and Norse traditions Yule is a 13 night, 12 day festival that is considered one of the most sacred times of the year. Yule begins on Mother Night, the night before the solstice which is often celebrated in honor of Frigga and the disir; in my family we celebrate Mother Night two days before the calendar date of the solstice because the eve of Yule has developed its own family traditions. Many modern heathens that I know choose to stay up on the night before the solstice in order to greet the dawn on the solstice morning. The day of the solstice itself is considered both the most powerful of Yule and also the most dangerous as both trolls and ghosts are roaming free on the night of Yule. On this day the Yule log is burnt and the most sacred oaths are sworn. Celebrations continue until New Year's, a day that itself is important since it sets the tone for the year to come; actions taken on the last day of Yule/New year's eve (or day) influence the year to come. Swearing oaths and making sacred toasts were sacred activities, as well as leaving out food offerings for the gods and spirits. Odin was especially associated with Yule time, as are the goddesses Perchte, Berchte or Holda. Yule bucks were made (the mask of a goat head, or a straw goat) and used for guising but was also believed to have its own separate spirit that had to be propitiated - often with ale or porridge - in order not to harm anyone in the family. Porridge is also left out as an offering to the house wight or spirit that lives in the home. A Yule tree was used for decoration and a yule log was burnt or in some modern cases a log is set with candles which are burnt. Now working with that as a base we can look at what we have for Yule traditions in Scotland. In Scotland McNeill states that while Odin may be known as the Yule Father it is Thor to whom this holiday actually belongs, as does all of the month of December. A Yule log of oak was traditionally burnt and Thor was asked to bring a prosperous new year. She relates a story of Norsemen in Scotland celebrating Yule with a great feast and then a bonfire, around which they danced and then chanted "Thor with us, Thor and Odin! Haile Yule, haile!" (McNeill, 1961, p. 52). In Scotland the "Christmas" season ran from Christmas eve until 12th Night, reflecting the older heathen practice of a 12 day celebration of Yule. Prior to the start of Yule the home was cleaned from top to bottom and stocked with food. During the period of Yule all household work like spinning and weaving was strictly prohibited as it was believed that to do such work, even drawing water, during the 12 days of Yule would risk the girls of the house being taken by a Kelpie. The hearth was cleaned and decorated to please the gods and garlanded with rowan to keep out mischievous spirits. On the eve of Yule the family would go out and collect the Yule log which would be brought in with great ceremony, an offering of ale is poured over it, and it is placed in the fire to burn through the night. In some parts of the Highlands the Yule log is associated with the Cailleach, the spirit of winter, and in those places the Yule log chosen would be the stump of an old tree. Special breads and cakes were baked on Yule eve, and ale and sowans were made with omens taken from how they cooked. First thing on Yule morning weather omens were taken to predict the year to come; green Yule meant snow in spring, warm Yule a cold spring, and a light Yule a good harvest. The rest of the day was spent in social gatherings and feasting. Another Yule tradition is guisers and mummers who travel from house to house in costume singing and offering entertainment and blessings in exchange for welcome into the home and some food. New Year's Eve, called Hogmany, has many traditions of it's own, including special cleaning of the home, settling any debts, returning borrowed items, and generally setting everything in the household right in preparation for the new year. At the exact stroke of midnight on New Year's eve the head of the household opens the front door and lets the old year out while welcoming the new year in with the words "Welcome in New Year! When ye come, bring good cheer!" (McNeill, 1961, p. 104). Another important tradition of New Year's is first footing, or the belief that the first non-family member who enters the home after midnight on new years while indicate the family's luck in the coming year, with a cheerful dark haired man being the best first-footer, with a pretty woman being second best. Anyone born with a deformity, of bad character, who is stingy, whose eyebrows meet in the middle, or who may have the Evil Eye are bad luck. To avert the ill luck of a bad first footing throw salt in the fire, burn a wisp of straw, or put a burning coal in water. In Scotland New Years is also a time of blessing the home and of omens. Holly, Hazel, and Rowan are hung up around the home and the entire home was fumigated with burning juniper. Burning the juniper was considered very important to cleanse the home and was done immediately upon waking before anyone ate breakfast. On New Year's eve a silver coin was left out on the doorstep and if it was still there in the morning it was seen as a sign of prosperity for the year to come, but if it was gone it was an ill omen. Wearing new clothes on New Year's day is good luck so is carrying a silver coin in your pocket. To see a red dawn on New Year's day means bad luck and strife to come and the direction of the wind is an omen of the year to come as well: "Wind from the west, fish and bread, wind from the north, cold and flaying, wind from the east, snow on the hills, wind from the south, fruit on trees." (McNeill, 1961, p. 115). In Ireland Yule was also started with a complete cleaning of the home which was followed by decorating with Holly, Ivy, Bay and other evergreens, and as in Scotland food was stocked up on. Preparations were made that included placing lit candles in the windows of the home; these are now associated with Christmas but may well be older as some believe the candles' light serves to guide and welcome the visiting dead who wander at this time of year. Some choose to light a special candle for any family members who have passed in the last year. As in Scotland the weather is seen as being an omen of the year to come with cold weather foretelling a warm spring; additionally a new moon was seen as especially lucky. Mumming and guising is also seen and New Years eve and day were strongly associated with divination and omens. While first footing isn't seen in Ireland the way it is in Scotland there is a belief that if the first person or animal to enter the home after midnight on New Year's eve is male and black or dark haired the house will have good luck. A special bread was baked and then hit three times against the door while the head of the house or house wife chanted either "We warn famine to retire, To the country of the Turks, from this night to this night twelvemonth, and even this very night." or "Happiness in and misfortune out from this night, Until a year from to-night" (Danaher, 1972, p. 261). After this the loaf was tossed out the door. So this actually gives us a lot to work with for celebrating both Germanic/Norse Yule traditions and Celtic ones over the course of a 12 day celebration. 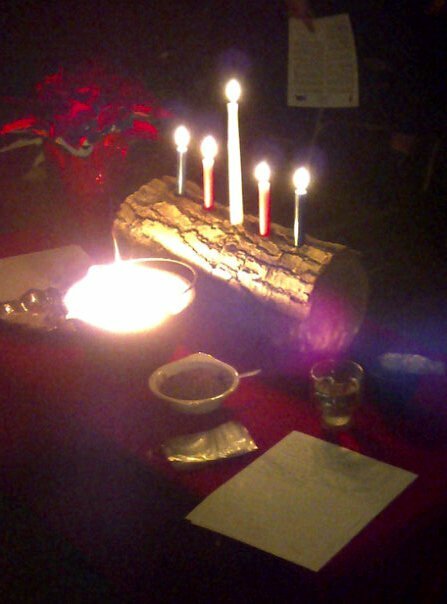 I like the idea of including Thor more in the Yule celebrations, especially as they relate to the Yule log, and of lighting candles for my ancestors, which I may do each night of Yule. Including the Cailleach makes sense as well. I also can easily see how to incorporate the specific New Year's eve and day traditions, such as welcoming the new year in and also the Irish custom of banging the bread on the door. And the multitude of divinations and omens can easily be used on the day of Yule and on New Year's day, as can the cleaning of the home before the start of Yule and the cleansing and blessing rituals of New Year's day. I'm excited to see how Yule this year is going to go as I work on finding the synergy of this path, which clearly has so much potential.